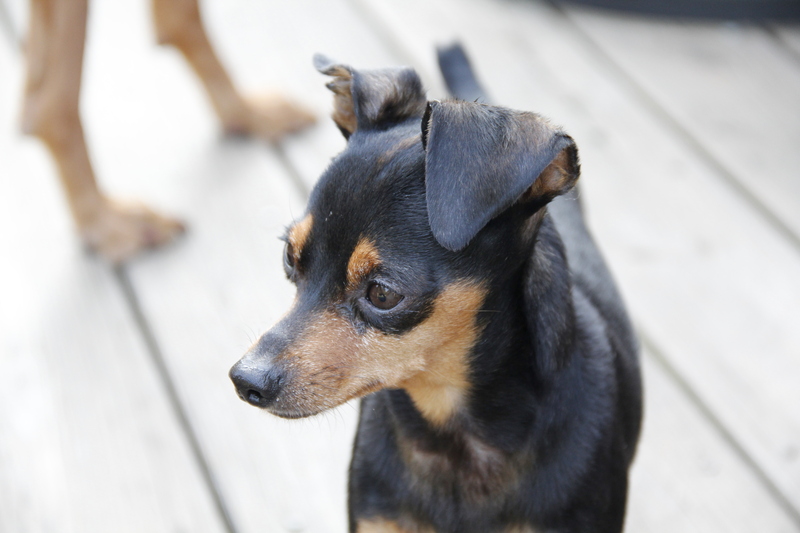 I’ve written previously about how fiercely protective my miniature pinscher is of his Momma. As far as he’s concerned, he was appointed guardian of my life. Yahoo News recently had a video clip of a miniature pinscher type dog driving off two men trying to rob a tobacco store. They had guns too, but turned and ran when the little dog exploded from behind the counter, chasing them across the street. It’s a great video to see. The little dog is only several pounds bigger than my own min pin. When I walk out the back door, he runs out ahead of me to take up his post at the top of the deck, scanning and scanning for all possible dangers. He doesn’t like it when I get in front of him – he’d rather I stay safely behind him. If I walk around him into the yard, he doesn’t acknowledge my presence, but looks around me to scan for danger. Yes, he normally wears a collar. I took it off for a few minutes as I practiced some head shots this morning. Word for tomorrow – PERMANENT. If you prefer to work ahead, see the list for the week under “A Word A Day”.